Whether or not they call it a Chevelle, GM's now very explicit plans are to build a vehicle in the same mold as their once extremely successful RWD car, probably sharing a platform with a new Australian model. Here's everything we think we know. In 2012, Chevy first gave enthusiasts a peek with their CODE 130R Concept, a small RWD car that was clearly aimed at younger-than-Camaro buyers. The idea was to get a feel for what the youth market wanted since, when the economy turns around, they're going to start buying cars. The Scion FR-S and Subaru BRZ have made it clear that there's demand for just such a thing. They initially wanted to debut that vehicle ahead of the next generation Camaro and build it on a smaller version of the same Alpha platform that underpins the Cadillac ATS, we hear, but two things doomed the 130R. First, GM canned Chief Marketing Officer Joel Ewanick. In addition to running the marketing side of GM he apparently took it on himself to solve the "youth problem" and an entry-level fun car like this was allegedly part of that vision. With Ewanick no longer pushing for it (and much of what he touched toxic) the project appears to have withered. Second, the Alpha platform apparently didn't quite scale down right. There are too many mass inefficiencies at a size below the new Alpha-based Camaro, which is the space the 130R was intended to fill. It works better going up in size as it's doing with the new CTS. Yet, GM North American head and CEO hopeful Mark Reuss says he wants to do a car that sounds exactly like the 130R and, recently, he's been a man of his word who has managed to offer enthusiast vehicles through clever business arguments that underline the cheapness of the endeavor or the necessity of using a platform they've already paid for. Just look at the surprise Camaro Z28, which resurrected a great name by repackaging a lot of parts already in the GM stable and cutting back on extras. It's a halo car that'll be cheap to make and probably profitable. The Chevy SS is another example. It's a halo RWD sedan for Chevy that's essentially a rebadged Holden. For various reasons, some political and some fiscal, GM needs to export vehicles from Australia. It's also why we have the Chevy Caprice police cars. And this is how we end up with a Chevelle. GM has already committed to $1 billion in manufacturing in Australia through 2022. That's for two vehicles and neither of them is probably going to be a massive RWD sedan for Holden as that market is drying up faster than the plains around Canberra. They'll have to be "global" products. One of those products is almost certainly the Holden Cruze. The other? No one is saying publicly, but we're hearing that it'll be the modern version of the Holden Torana. No one in Australia (maybe the accountants) wants the brand to go fully FWD/AWD and a small RWD platform lets them do what they're maybe not going to do with the next Commodore. The Holden Torana is a famous Australian nameplate that made a reappearance as a concept in 2004 with a twin-turbo 3.6-liter V6, which previewed the mid-2000 Holden VE Commodore. We've heard that the Australians have built styling mockups of a new Torana, and maybe even some clay models, but none of those have leaked as of yet. In order to make a Torana as part of this massive expansion there's going to need to be a global market for the vehicle. Enter the Chevy Chevelle. This is a very popular rumor and they're not helping it by trademarking the Chevelle name. If you look at the naming convention that GM has (Camaro, Malibu, Impala) there's a nice slot for a Chevelle-like vehicle. "A really nice, light, rear-drive car that's inexpensive — we know that rings a bell," the GM North America president told Automotive News last week. "That'd be a huge win for us if we had that." He went on to add that the platform has to be "really scaleable and efficient." He also said it wouldn't be Alpha. Although it won't be the CODE 130R because that design is already too dated, we hear it'll still look like a 1-series and a Camaro did the dirty and will get a four-cylinder engine as its only option. Reuss was clear to say it wasn't even on the drawing board, which may be true, but could a similar car be on a drawing board somewhere in Australia? Fingers crossed it doesn't get killed off like the Pontiac G8 ST or other promised Aussie delights if it does exist. UPDATE: In response to me tweeting out the story, Mark Reuss had this to say, which we think is his way of saying (thanks to a translation from Ray Wert) that he needs to go on a quiet drive to the Indy 500 to think about a creative way to do it. 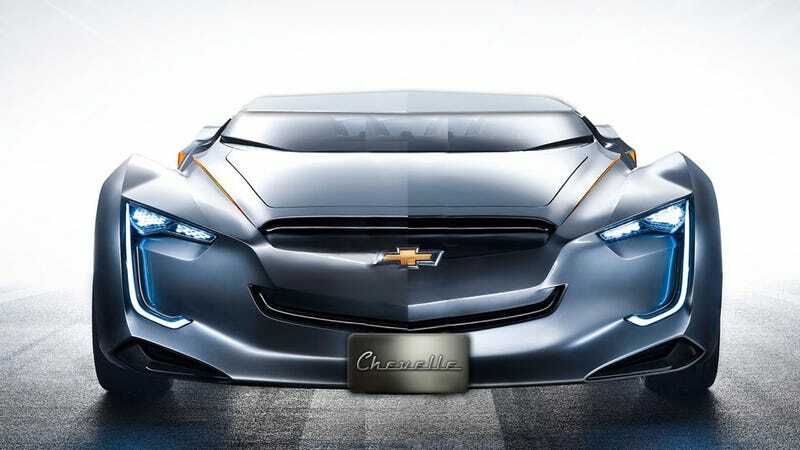 Photo Credit: GM, topshot is of the Chevy Miray concept with a roof and cheesy license plate.